Layfield's Debris Netting is a lightweight, fire retardant scaffold wrapping material. Our Debris Netting is manufactured from sturdy HDPE fibers; its knitted fabric structure makes our netting surprisingly strong and resilient to mechanical damage. As produced, Layfield's Debris Netting is 3.05 m (10') wide and has 65% open area; however it will stretch a considerable distance to accommodate wider coverage areas. Layfield's Debris Netting complies with NFPA 701 method 2 fire retardancy test. 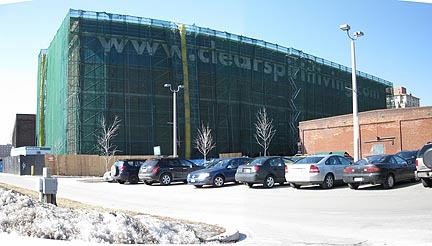 Debris netting is installed vertically to prevent small items from falling off the scaffolding. Debris netting is not rated for catching heavy items or for worker safety. All safety barriers must be in place before debris netting is attached to scaffolding.